WhiMSy love: Kitty Cat Party! 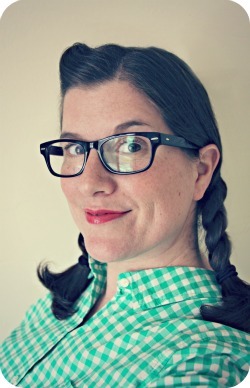 I've been on the prowl (har har) for kitty themed items that would be perfect for my wee daughter's upcoming 4th birthday party. And my button making obsession has come at the right time. 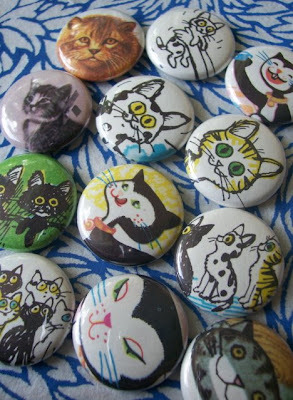 I've been making kitty buttons from images found in vintage books from the thrift store. These will be some of the little gifties that I'll toss in the guests goodie bags. 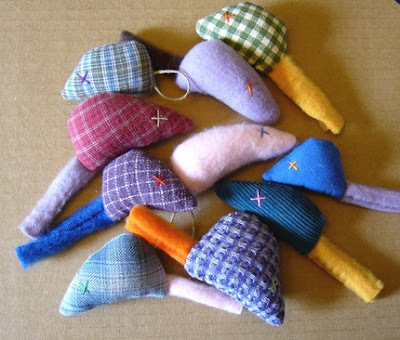 I found these ADORABLE mice---made from all sorts of random fabric, string, & ribbon bits---from spidercamp. I ordered 10 but they sent me 13. I don't know if it was a mistake. But I'm not giving them back. It was a really cool surprise. These will be a SUPER addition to the kids' goodie bags. And then I purchased my very first ACEO from time2cr8. (ACEO stands for "Art Cards, Editions & Originals". They are 2.5" x 3.5".) I plan on framing it for the birthday girl. The reason I am so in love with this print is--not only does it have a CAT on it (purrrfect for the party! 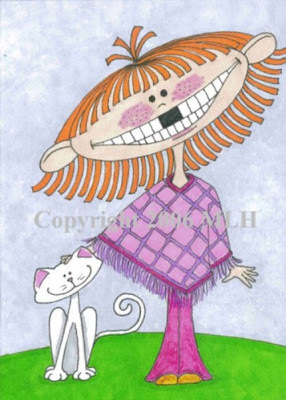 ), but the little girl is wearing my daughter's favorite color AND her two front teeth are missing. My wee one had an accident a year ago & her two front teeth are now invisible. This picture just totally reminds me of her. I also asked the artist to create some small tags from this image to tie onto each of the goodie bags. Each child will leave the party with their own piece of tiny art! The party will be an odd mix of "Cat Theme/Water Theme" since it'll be super hot by the time her b-day rolls around at the end of June & we don't want the party guests passing out or melting. The kids will be able to have some water fun in the backyard: slip-n-slide, water balloons, etc. And cats hate water so that is kinda funny. I LOVE planning my kid's birthday parties. I like to plan as far ahead as I can. As their special days gets closer & closer I'm constantly asking my girls what kind of party they want. They're always changing their minds so eventually I have to get pretty firm & let them know the party planning fairy needs answers FAST--or else!!! I'm just glad my soon-to-be 4 year old didn't stick with her original request of an "eyeball" party. Who knows where that even came from. She says weird stuff all the time. Cats are SO much cuter than eyeballs. Oh, but she did specifically request mini kitty cat pinwheels on her cupcakes. Yes ma'am. You and your girls are such a trio! I love it! My daughter's birthday is shortly after we get back from Spain, so probably not doing anything involved this year, but I'm already hatching plans for a big woodland fairy party next year. Aww..this party is gonna rock! I love the kitty cat buttons! Yes, cats are definitely cuter than eyeballs!! lol!! Too cute! Ha! The 13 mice weren't a mistake, but I forgot to put a note in the package, whoops - it occurred to me at the last minute that little kids are fickle and it would be a shame if somebody decided she didn't WANT a blue mouse, she wanted a GREEN mouse, and had a meltdown. So I threw in a few extra. Even if you don't use them at the psrty, I figured you'd know a cat, or kid, or cat-kid, who would like them. it's going to be a GREAT birthday party! that pic is so cute - she's going to love it!